Welcome back to the seventh episode of my brand new podcast: The Homemaking Foundations Podcast –Where we give you the tools, inspiration, and encouragement you need to craft a Gospel-Centered Home. In case you missed it, you can listen in to the last episode here: Episode #006: Freezer Cooking & My Homemaking. As a busy wife, mom, and blogger, it can be really hard sometimes to know where I should spend my time. Between all the chores around the house, cooking 3 meals a day, trying to show love to my husband, caring for and nurturing my kids, and squeezing in some time to write…some days I just don’t know where to start or what I should spend my time on. If I didn’t have to sleep or eat, maybe I could get it all done. But it’s impossible. I can’t say yes to everything, I know that I need to have priorities in my homemaking but the hard part is knowing what those priorities should be! 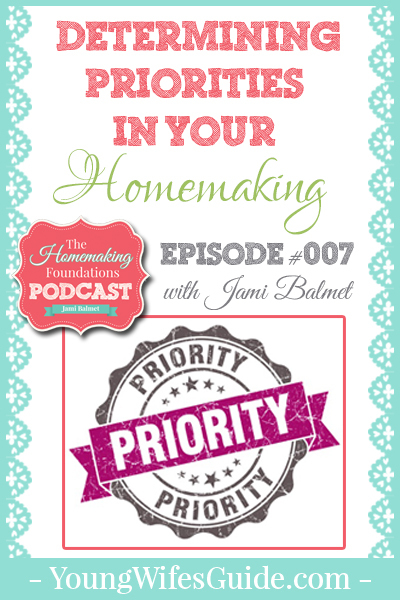 That’s what today’s episode is about: Setting priorities for our life and homemaking so we can better determine where we should spend our time as homemakers. I created our personal and family priorities last Summer and it has been so freeing knowing what my husband and I have decided on as priorities in our lives. It allows me to freely say yes to the priorities we’ve established and happily say no to the things that don’t line up. I was inspired to do this last year by the book Say Goodbye to Survival Mode by Crystal Paine. Hf #1: What Does it Mean to be a Homemaker? Of course today I am going to highlight one of my very favorite books, Say Goodbye to Survival Mode. The author is Crystal Paine from Money Saving Mom and I just can’t get enough of what she has to say! Her book has been transformation when it comes to how I run my household and feeling like I’m actually in control of my home! Let me just tell you, that with 4 young kids, I often feel this desperate survival mode. Like I’m walking through each day just barely surviving. Just holding on until bedtime for when I wake up and do it all over again. If you have ever felt this desperation at trying to manage it all and feeling like you are barely treading water (or maybe you feel like you are drowning!!) then this book is for YOU! I highly recommend it. It’s my #1 resource that I recommend for homemakers who are feeling overwhelmed or lost in how to practically manage their home. This book comes in a hard copy, on Kindle, and even as an audiobook! If you have hung around my blog for very long, you know that I am a huge fan of audiobooks! They allow me to read so many more books than I could ever sit down and find the time to read. I listen to them while I cook, clean, play outside with my kids, and driving and running errands. AND you can actually get this book for FREE when you sign up for a free 30 day trial to audible. Just make sure to cancel the 2nd month if you don’t want to continue. But my husband and I ave a monthly subscription to Audible and love it!